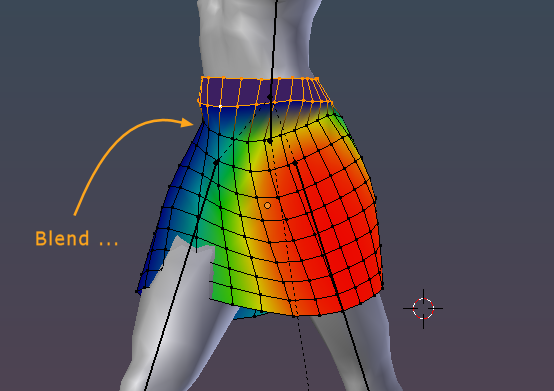 In the following we try to improve the skirt’s animation. And while fixing the various parts of the mesh, we will introduce a couple of helpful tools for the task. Ensure you are in Edit mode. 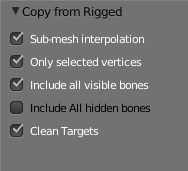 In the Tool Shelf find the function “Copy from Rigged” in the Avastar Tools Panel. Notes: When you work in weight paint mode and you are in Selection mask mode, or when you work in edit mode and have a subset of vertices selected. then only the selected verts receive new weight values. In all other case the tool copies the source weights to all vertices of the target mesh. In the yellow box on the image above you can see that Avastar copies the weights from 6 other meshes. These other meshes are the “sources” of the weight copy. 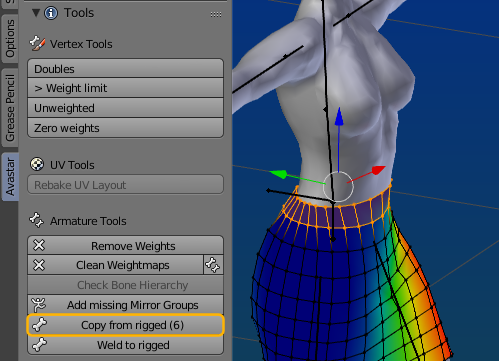 Please be aware that the tool only takes meshes into account when they have been rigged to the same Armature as the skirt! Any other objects are ignored. For the engineers: The weight copy function projects the weights from the source meshes to the target vertices. Sub-mesh interpolation: for calculating a better approximation of the transferred weights. Only selected Vertices: If not selected then the tool copies weights to the entire mesh. Include All hidden bones: to get the best weights to match as close as possible to the SL Avatar. Clean Targets: Remove the weights for the selected verts before doing the Weight Copy(1). 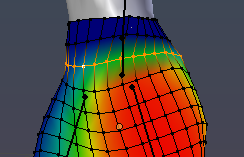 Now the 2 top edge loops of the skirt should move almost in the same way as the Avatar meshes do. In our case that is: the selected verts no longer move with the legs. You can verify this by scrubbing along the timeline. (1):If you select this option, then the tool cleans up the weight groups from any previously assigned weights. As a result your weight copy operates on a clean target. If you deselect the option, then weights are still copied, but all untouched verts keep their previous weights. You can use this when you do partial weight copies for different areas of your mesh. However we realize quickly that fixing the 2 top edge loops gives us an ugly stepping in the 3rd edge loop. This becomes even more clear when we scrub over the timeline again. But there is an easy fix for this, the Blend tool. The Blend tool is part of blender’s native weight tools. You find it in the Tools Sidebar and there in the Weight Tools Panel. The tool works on each selected vertex by searching all its adjacent deselected vertices, then it averages the weights of the boundary verts and applies them. Thus if used with care, then you can get a nice blending of the weights. Ensure you are in Edit mode! Open the Tool shelf (type “t”). 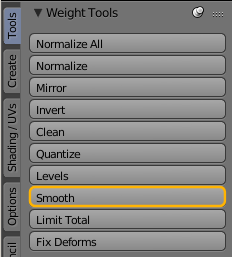 Open Blender’s vertical Tools Tab. Locate the Weight tools Panel and Pin it by RMB click on the Panel name, then enable the Pin option. Now step back to the vertical Avastar tab. Now you can open both panels and you have all tools all at one place. Select the 3rd Edge loop which we now want to adjust. Open the Tool shelf and enter the Avastar vertical tab. 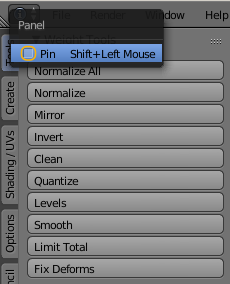 Open Blender’s pinned Tools Tab (1). Now call the Smooth tool. (1): If you need to know how to pin the Blender Weight Tools Box then see the Tip above. 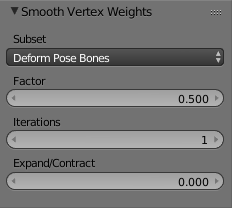 Subset: you want to select Deform Pose Bones. This will average all weights such that the transition to the adjacent edge loops becomes smooth. You can go ahead by selecting the next lower edge loop and apply the smooth tool again, but use a smaller smooth factor. Or you can try to use the smooth tool on several edge loops in one go. The top part of our mesh already behaves quiet nice. On the image you see the result after i have applied the Blend tool to the edge loops 3, 4 and 5 (counted from the top of the skirt). 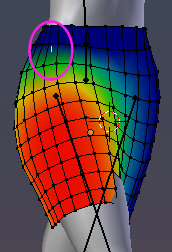 However we find some small spots with poke through (see center of the pink ellipse ) such issues can simply be fixed by adjusting the mesh itself. Trying to do this with optimizing your weights will often end in a disaster. So just grab the verts near the problem zone and adjust them slightly. We keep the weights as they are and use an Alpha mask to get rid of the poke through. This is the most efficient method (and thus the recommended method) to fix this. Go the long way and try to fix this by adjusting the weights. This is a challenge, although you can do it rather quickly. 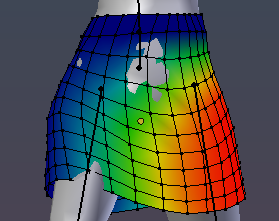 Just edit the skirt mesh until the poke through goes away. Although this is somewhat tedious we will try to use the Weights editor to fix this. But i warn you this is… work! Open the properties sidebar of the view port (by typing “n” on the keyboard). Select one of the verts which you want to fix. 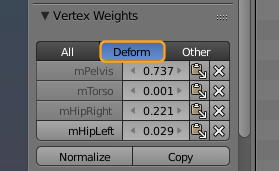 Now you can edit the weights in the Vertex weight editor by either typing the numbers, or dragging the values by using the LMB. Note: The mHipLeft weight group is displayed on the mesh. Display another weight group by clicking on its name in the list. The Deform button enables a filter that shows only weight groups of deform bones. You see that the selected vertex has 4 weights. And 2 of these weights are very close to 0. While this is in most cases not a big problem, this can occasionally cause some headache because it may become possible that far away bones influence mesh areas just a bit. But sometimes they add small or sometimes even quiet visible distortions. Also with each additional Weight the mesh movement becomes much more complex and unpredictable. So it is in general a good idea to have as few weights as possible to avoid clutter of any form. And just in the case you do not yet know: SL supports no more than 4 weights on each vertex. It is not defined what SL does when you ignore this limitation. Although Avastar fixes this automatically for you during export of a rigged mesh, you should keep the control and keep this restriction in mind during your weighting. How many weights on a vertex? In almost every case having more than 2 weights on a vertex is a good way to get into trouble. Of course sometimes you really need to use more weights, but actually you should avoid this as much as possible. Believe me or not, but LindenLabs have constructed the SL default Avatar rather nicely . You find only verts with one single weight (grey areas) or 2 weights (green areas) and we find no vertex with more than 2 weights.